There’s a picture meme making the rounds in Facebook where you have to post 24 pictures of yourself in different settings. Since I’m such a narcissist and I have nothing to blog about, I decided to make the picture meme here, in increments. 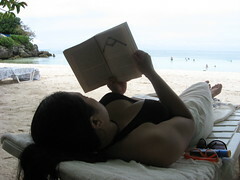 I’m thinking it could also be my unofficial profile for my quest in “lukin 4 a hubby n d internetz”. Wahahaha! 🙂 Kidding, of course. 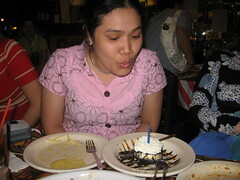 This was during my 25th birthday celebration at TGIF in Rob Midtown with few of my closest office friends. Mayaman pa ako nito. 🙂 Ngayon, “Thank you” na lang pag binabati ng happy birthday. Hahaha! 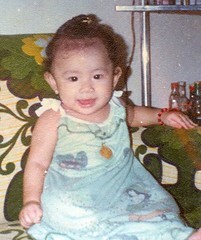 According to my mother, I was 11 months old in this photo. Donya Buding in the making, see? Looking at my baby pictures, the desire to have children come rushing to me. Maybe they won’t be too bad. Actually, my future children may not be the most good looking in the planet, but they will sure kick arses in the awesomeness scale. Mark my words. Hahaha! This was taken by Kuya Alex in front of Cafe By The Ruins in Baguio during an outreach. great meme! hehehe… i like the way you want to spend everyday. i wish we can really just do that. huh? bakit di ka pumasok? pasok ka bukas. 12 noon pala lagi lunch ni cualaine this week. last day na bukas nun! 🙂 let’s go to my boyfriend’s resto kung di bumabagyo. miss ko na yung chicken.